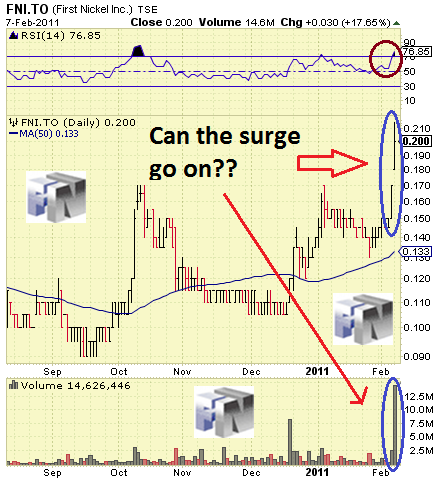 For two days, the stock of First Nickel Inc. (TSE:FNI), (PINK:FNKLF) has started to fly north on the charts. What is more, it is doing it with some style and class. Need a proof? Then take a look at yesterday's session on the Toronto Stock Exchange (TSE). FNI set two records - an unseen turnover of 14.6M shares and a 2-year high of $0.215. Since Friday, the stock has jumped by 38%. However, things are not as bright and simple as they seem. If we analyse more deeply the available company data, we can find several not so pleasant factors that might influence negatively the shares' performance. The Lockerby Mine is "the cornerstone" of First Nickel's Sudbury operations as stated on the company's website. This sounds good, right? However, if we read a little more, we will find out that currently the mine is actually ... not producing anything. Since October 2008, it has been placed on care and maintenance "due to low metal prices". It turns out that, at present, the "cornerstone" of the company is not of much use: no commercial production - no revenues. This is hardly pleasing to investors. Besides, it is not certain when Lockerby will commence production and how successful it will be. So far, First Nickel has incurred significant care and maintenance expenditures on the mine without receiving any earnings. Somewhat discouraging data derive from the filed financial reports for the third quarter of 2010. At the end of September 2010, working capital was $4.95M, this is a decrease of over 23% since Dec. 31, 2009. Having in mind all mentioned, we might suppose there is probably no solid ground for a more lasting appreciation of the company's shares. Maybe, the current surge is driven mainly by short-term speculative motives. Still, making any predictions is very risky indeed. Yeah, all hopes are in Mr. Cresswell. looks like they will make money in the next couple of quarters moving forward. This increase in volume trading is no surprise. With the recent annoucement of raising millions to get back into production, I expect with nickle prices rising we should be hearing marching orders to get back to work.